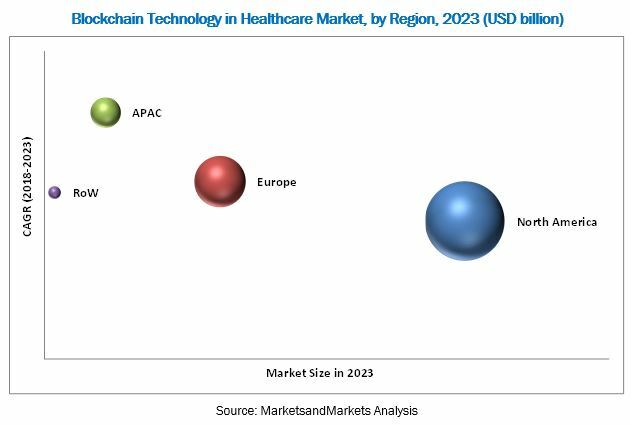 [128 Pages Report] Blockchain technology in the healthcare market is expected to reach USD 829.0 million by 2023 from USD 36.9 million in 2017, at a CAGR of 72.8% during the forecast period. The base year considered for the study is 2017 and the forecast period is from 2018 to 2023. Some of the prominent players in this market are IBM (US), Microsoft (US), Guardtime (Estonia), PokitDok (US), Gem (US), Chronicled (US), iSolve (US), Hashed Health (US), Patientory (US), Factom (US), Proof.Work (UK), SimplyVital Health (US), FarmaTrust (UK), Blockpharma (France), and Medicalchain (UK). Further breakdown of the European healthcare blockchain market into France, Slovenia and Switzerland. Blockchain technology in the healthcare market is projected to reach USD 829.02 million by 2023 from USD 53.9 million in 2018, at a CAGR of 72.8%. Factors such as increasing incidences of medical data breaches, rising entrance of counterfeit medicines in the pharmaceutical supply chain, adequate funding to healthcare blockchain startups, government initiatives to implement blockchain in healthcare, and increasing adoption of blockchain as a service (BaaS) are driving the growth of the healthcare blockchain market. The report analyzes the healthcare blockchain market by application, end user, and region. On the basis of application, the market is segmented into supply chain management, clinical data exchange and interoperability, claims adjudication and billing management, and other applications. In 2018, supply chain management segment is expected to account for the largest share of the market due to the implementation of stringent regulations such as the Drug Quality and Security Act (DQSA) in the US and the Falsified Medicines Directive (FMD) in Europe to address the increasing incidences of counterfeit medicines is driving the adoption of the blockchain technology in healthcare supply chain management. Based on end user, the market is classified into pharmaceutical companies, healthcare payers, healthcare providers, and other end users. Pharmaceutical companies segment is expected to account for the largest share of the healthcare blockchain market in 2018. Stringent regulations to secure pharmaceutical supply chain and increasing incidence of counterfeit drugs entering the supply chain are factors boosting the adoption of blockchain in the pharmaceutical industry. In 2018, North America accounted for the largest share of the market, followed by Europe. The large share of North America is attributed to increasing incidence if data breaches in the region, stringent regulations to improve pharmaceutical supply chain, growing incidences of fraudulent billings, and the rising need to address the dramatic rise in healthcare costs in the region. However, lack of a central entity & common standards and lack of awareness & understanding of the use of blockchain technologies in the healthcare sector are expected to restrain the growth of this market to a certain extent. *Details on Business Overview, Solutions Offered, Recent Developments, SWOT Analysis & MnM View Might Not Be Captured in Case of Unlisted Companies.